The ponds are 50 hectares each and are surrounded by elevated dikes reinforced by concrete walls. 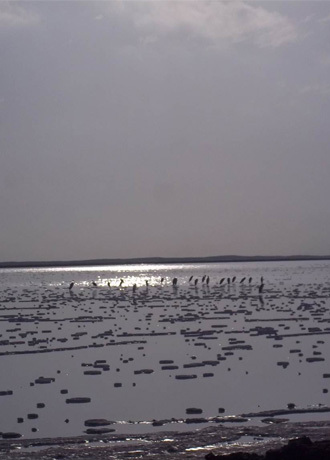 These ponds are filled and drained throughout the year to allow for the crystallization of the salt to be harvested. The dikes separate the ponds and serve as corridors for the machinery. They also contain a complex set of canals supply and drain gates used to regulate the pumping and evaporation operations. 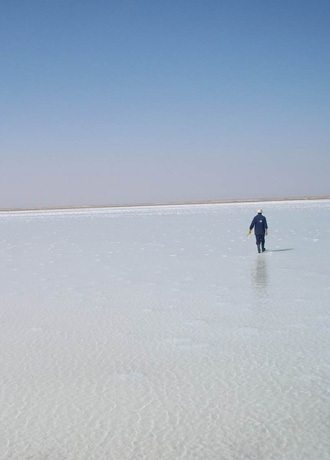 The ponds are lined with a first layer of salt about 20 cm thick used for sealing and giving the needed mechanical resistance for the work of heavy machinery such as harvesting , curing and maintenance. Brine water is pumped in the ponds via the different surrounding canals. The brine circulates through the area of the pond allowing for a uniform and controlled salt crystallization. The water level provided by the pumping rate and controlled by the drain, ensures a uniform and followed production process. Alternating filling and draining the ponds ensures a good control of the content of the sulphates as well as the proper disposal of impurities. The salt layer settles above the first 20cm layer and is harvested when it reaches the proper thickness and crystallization. The ongoing analysis of the brine pumped and the degree of crystallization allows to both optimize the quality of the salt that precipitates and to define the appropriate time to begin the harvesting.